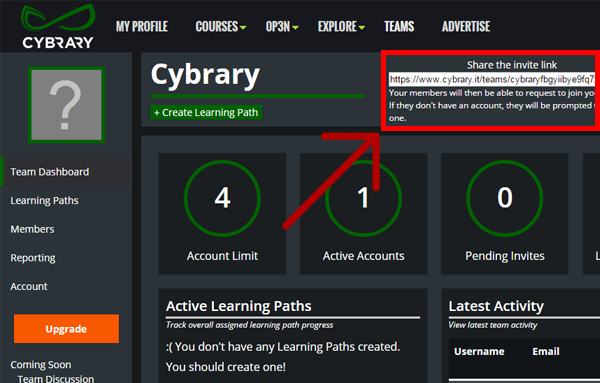 Cybrary has been working hard to release our newest platform for individuals, allowing them to learn and develop their cyber security skills on Cybrary together. Drum-roll, please…Introducing Cybrary Teams! With Cybrary eclipsing the 500,000 Registered Users mark, we sought to find a way to bring people closer together to learn, share, and grow beyond what’s currently available on Cybrary. 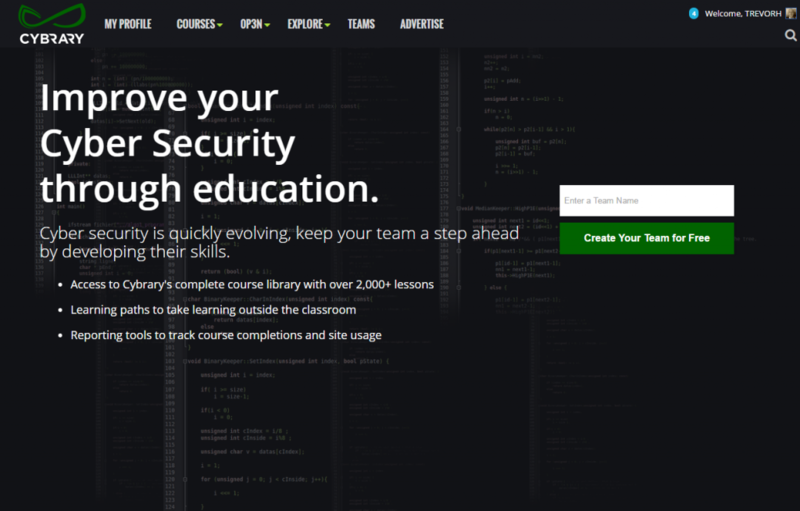 We believe Cybrary Teams will be able to meet the needs of learning cohorts, IT/Security Teams, Educators, End User Security Program Initiatives and soon, for pre-hire assessments. Cybrary Teams have access to Cybrary’s complete course library with over 2,000+ lessons, the content repository, learning path creation, and robust reporting tools to track course completions and site usage. Team administrators will now have access to a dashboard, which provides a snapshot of their Team’s activity including their account size, active members, pending invitations, lessons completed and posts viewed. 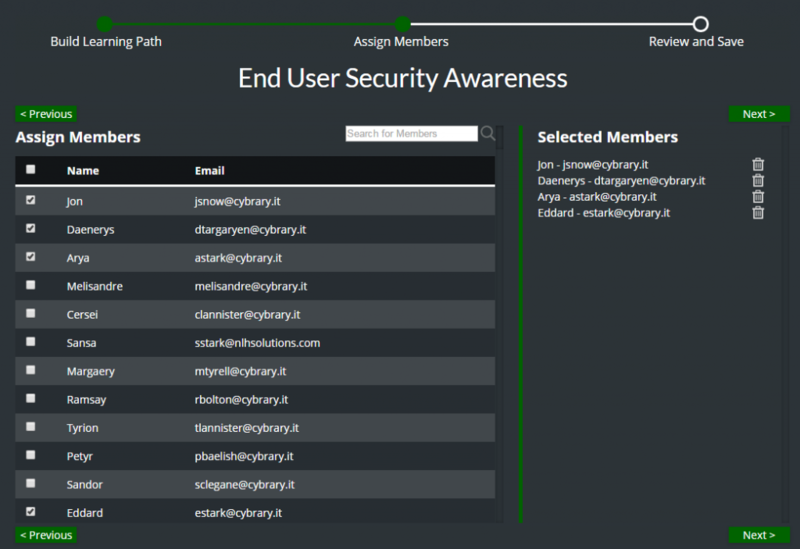 They can identify inactive members, see recent Team activity, and monitor their Team’s progress through a newly launched concept, Learning Paths. Any registered User on Cybrary can create and build a Team. Pick a name that’s unique to your organization or group and hit Create! When members receive and navigate to your Team’s unique invite link, they’ll be able to request to join your Team. If they don’t have an account, they’ll be prompted to create one. 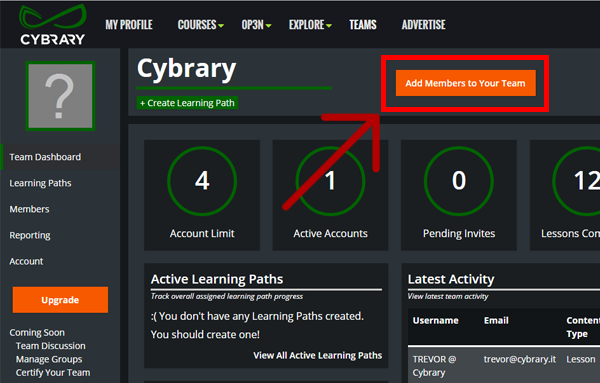 As your members begin flocking to Cybrary, they’ll request to join your exclusive Team. Team Admins will be notified of new member requests and can approve/deny, as necessary. From the Members Tab, Team Admins can Approve or Deny individual members OR use the Approve All function to save time and approve all new member requests. Already know who’ll be joining your Team? Pre-Approve email addresses from the Account tab. Users that register on Cybrary, with a matching email, with be automatically approved to join your Team. We’ve built in robust reporting that allows Admins to gain insight into the progress of their team’s cyber security skill development. 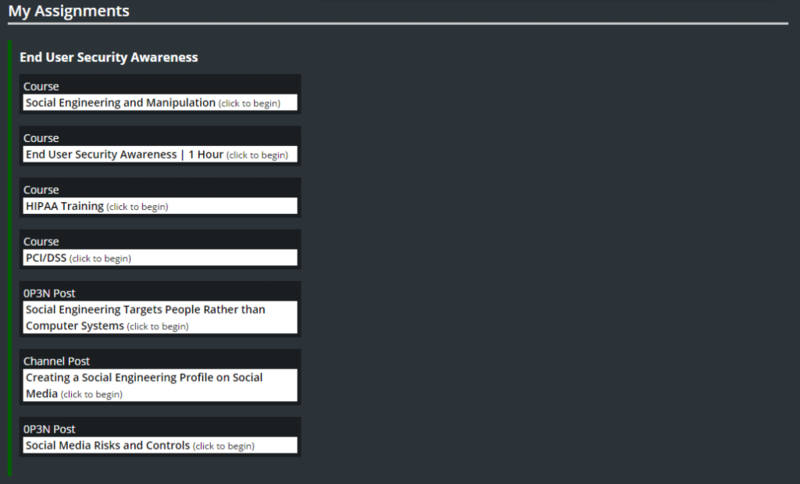 Identify users that have completed a course, or have not completed a course, using the Reporting Filter. Report on your Team’s login activity and follow up with members that are not using the platform. Ready to export your data into a CSV format? Easily export your data to perform your own analysis or upload it into your LMS to report on your Team’s development. 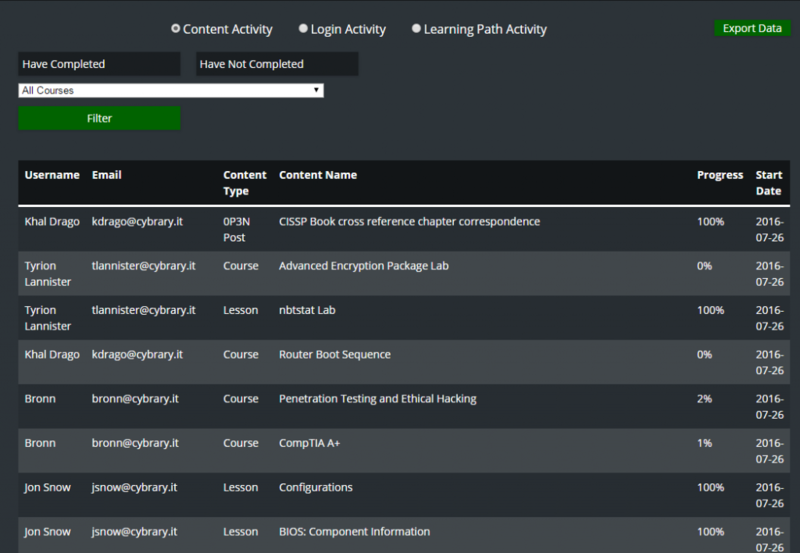 Our new Learning Path builder allows Admins to leverage Cybrary’s extensive content library to provide a sound and truly unique learning experience. Create a New Learning Path to assign to your members. 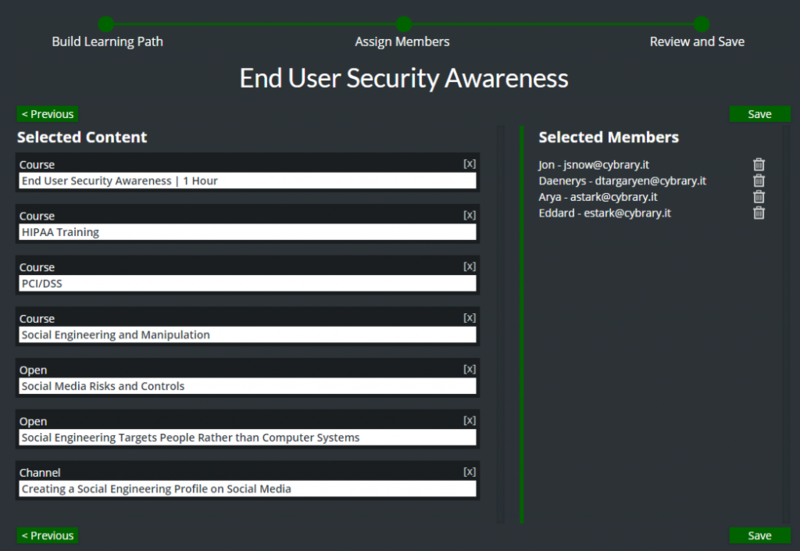 Select individual members or all members to assign your Learning Path to. Perform a final review (not to worry, your Learning Path can always be edited to assign new content or assign new members) and assign your Learning Path. Included members will be notified of their new Learning Path and can begin their development! Admins can report on the overall progress of the Learning Path from the Team Dashboard, or each user’s progress, from the Reporting Tab. Members can view their assigned Learning Path and progress through each step to meet your organization’s initiatives. Admins can report on the overall progress of the Learning Path from the Team Dashboard, or each user’s progress from the Reporting Tab. For additional questions or inquiries, please reach out to the Cybrary Team. Team Discussion: Members will be able to communicate and discuss their training, current trends in cyber security, and more! Reporting Improvements: Members will gain better insight into their learning progress. Reporting Improvements: With the help of many of our early adopters, we will be including more filters, more exact reporting from the Reporting tab, and an even more robust CSV export. Enforce Video Time: Admins will have the ability to enforce Video time during the lessons. This enables a setting that will prevent users from simply clicking through lessons to complete a course. A huge thank you to all of our users and the Team Admins who are working with us to make Teams the center of the learning experience at Cybrary.